While a leisurely stroll along the cobblestone streets of Old San Juan is always enjoyable, taking a ride on the trolley will enable you to see far more in the time that you have. The trolley service, of which there are four different routes to choose from, is free, but since there is no tour guide to explain what you are passing by, it is always a good idea to plan in advance which stops you want to explore further. For those who would prefer to bypass the shopping and entertainment areas, and head straight to the forts and museums, then the El Morro trolley route is the best one for you. El Morro itself is a 16th century fortress, and is the highlight of this route, but you will also have the opportunity to further explore Fort San Cristobal, which was one of the largest Spanish forts ever to be built. This trolley route also stops off at two fascinating museums, the San Juan Art and History Museum and the Pablo Casals Museum, both of which are worth taking the time to visit. The City Hall trolley route is ideal for those who would prefer to explore the forts in their own time, and use the trolley to navigate around the busy shopping and dining streets of Old San Juan. Unlike the open-air trolley of the El Morro route, this one is enclosed and air-conditioned, and takes you around some of the area’s main shopping and dining spots, including Fortaleza and Calles Tanaca. Every stop on this route will lead you to one-of-a-kind stores, but try to avoid the hopping on or off at stop number one, as this is the main stop used by cruise ship passengers and can often become quite crowded. Another enclosed and air-conditioned trolley, the City Hall/El Morro route is a combination of the two other routes. After taking passengers around Old San Juan’s main shopping areas, it then travels up past Fort San Cristobal alongside the ocean, before reaching El Morro. This is the longest of the trolley routes, and is the best option if you only have one day to explore Old San Juan, as it takes you past all of the city’s most iconic sights. 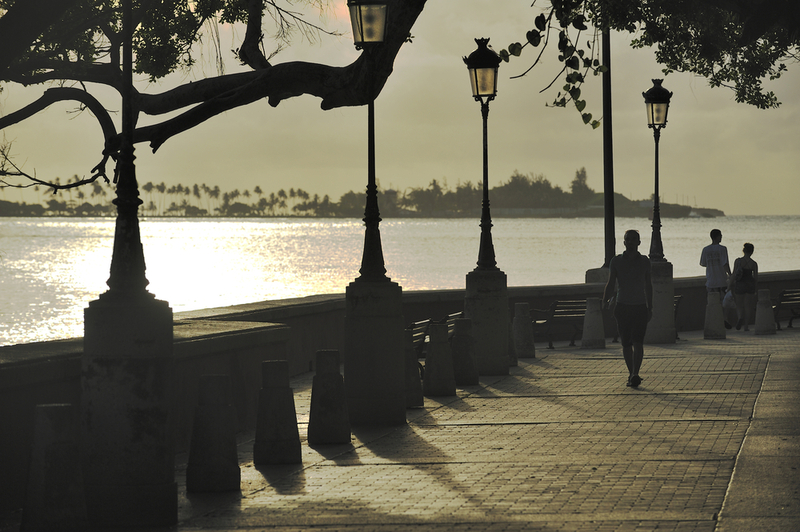 If you only have time to hop off at a couple of stops, make Paseo de la Princesa one of them, as this tree-lined esplanade, that dates back to the early 19th century, is steeped in heritage, history and culture, with everything from street musicians to antique statues and benches. The Old San Juan Trolley is a great way to explore the area, and, if you are able to spend more time in the city, it will give you a good idea of places that you want to visit again. When using the trolley for sightseeing, keep in mind that many locals use it as their main form of transportation, so it can often become quite crowded during the start and end of the business day.